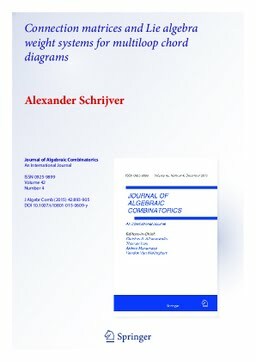 We give necessary and sufficient conditions for a weight system on multi- loop chord diagrams to be obtainable from a metrized Lie algebra representation, in terms of a bound on the ranks of associated connection matrices. Here a multiloop chord diagram is a graph with directed and undirected edges so that at each vertex, precisely one directed edge is entering and precisely one directed edge is leaving, and each vertex is incident with precisely one undirected edge. Weight systems on multiloop chord diagrams yield the Vassiliev invariants for knots and links. The k-th connection matrix of a function f on the collection of multiloop chord diagrams is the matrix with rows and columns indexed by k-labeled chord tangles and with entries equal to the f value on the join of the tangles. Schrijver, A. (2015). Connection matrices and Lie algebra weight systems for multiloop chord diagrams. Journal of Algebraic Combinatorics, 42(4), 893–905.